In our fast paced, technology-driven lifestyle, making time to head outdoors, enjoy nature and some get exercise has never been more important. One outdoor activity that perfectly combines those three things and is sometimes overlooked is golf. 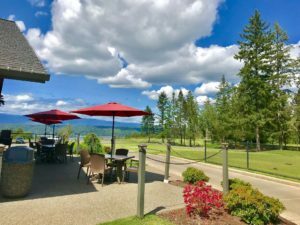 Golf provides a host of wonderful benefits as I learned at Alderbrook Golf and Yacht Club. It’s simple to learn, yet challenging enough to keep you coming back again and again. If you don’t believe me, take a look below at all the things golf has to offer. Golf is good for both your body and your brain. Studies show it helps improve muscle endurance and balance in a low-impact, casual environment. In one study published in the British Journal of Sports Medicine, researchers found a positive association between golf and good physical and mental health. Golf was shown to provide good muscular and cardiovascular activity and evidence suggested people who play golf have better balance and muscle tone. On top of that, outdoor activity helps to boost mood, lower blood pressure and even improve memory. Golf is a great way to get to know people. Acquaintances can become friends after just a 9-hole round on the golf course. Golfing provides plenty of time for conversation or surprise a date with something other than the same old dinner and a movie with a round of golf instead. Golf is great for your work life too. 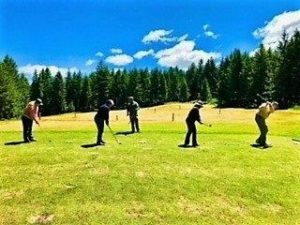 Whether you are team building with your colleagues, or getting to know a new client, golfing provides a relaxed atmosphere that takes you out of the office. An 18-hole round of golf is the ideal place to spend time with your mentor. Time in the golf course can feel a lot less like a game of twenty-questions and more of an opportunity to learn about your mentor and what helped them succeed. Taking up golf as a family activity can be a great way to connect with your children. Focus, patience, and problem solving are all skills that kids develop when they play golf, not to mention good sportsmanship and manners. Families will also find the added benefit of stepping away from the screen and having face to face time to talk and connect with each other. The relaxed environment allows for conversation and interaction while making memories that will last a lifetime. And the greatest benefit of all? Golf is fun. Take a relatively simple concept, hitting a ball with a club until you get it in the hole, add unlimited variables, and you get a game that’s different every time you play. The weather is different. Where the ball lands is different. The people playing with you may be different, too. The variations inherent to golf can make both the unexpected and the familiar equally rewarding. Alderbrook’s head professional, Sam Smith, didn’t play golf until college. After a serious car accident, Sam needed physical therapy to recover. He learned golf and credits his time spent on the course to his recovery. He has been hooked ever since. 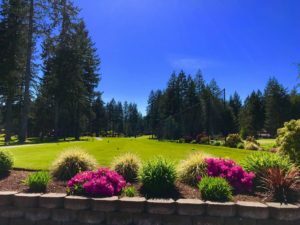 Alderbrook Golf and Yacht Club provides a great course for those wishing to take advantage of all the benefits golf has to offer. Just 40 minutes from Olympia, Alderbrook’s course is nestled among the trees over the southern shore of the Hood Canal. 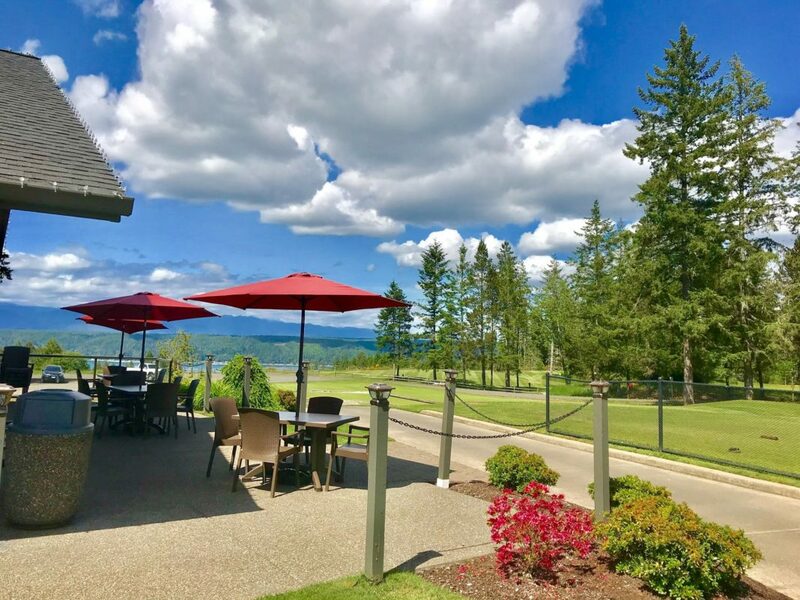 New and experienced golfers alike can step away from the business of everyday life, while enjoying spectacular views of the canal, local wildlife and the Olympic Mountains. After a round, golfers can step into the clubhouse to enjoy drinks or a delicious meal. On Saturday October 20, from 9:00 a.m. to 11:00 a.m., Alderbrook will host a new golfer’s orientation. 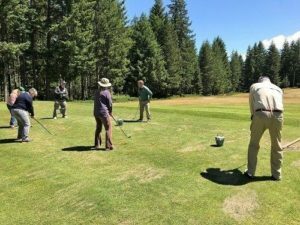 They invite the public to register and join them at the course for lessons on swinging, putting, booking tee times, renting clubs, basic rules and etiquette, and more. Afterwards participants are invited to try their new skills for a complimentary 9-hole game on the course. To register for the October Golf Clinic or to book a tee time at the Alderbrook Golf and Yacht Club, call 360-898-2560 and press 1 to speak with the pro shop.